Give the gift that is sure to put a smile on someone’s face. 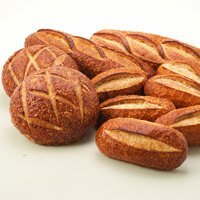 Our expert Bakers have created hand-sculpted sourdough breads reminiscent of the traditional icons from San Francisco’s Fisherman’s Wharf. 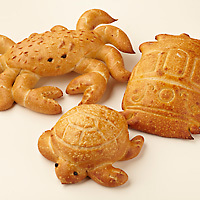 The Crab and Turtle make for the perfect edible dip holder. Cut the top portion, hollow out, and fill. It’s that easy. Includes: 1 lb. sculpted crab, 1 lb. sourdough cable car, 1 lb. hand-sculpted turtle. From Lona Reeve of Birmingham, Alabama on 9/17/2017 . 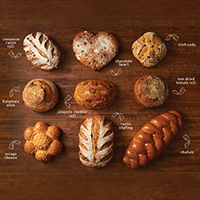 Enjoy the best of both worlds all year with a Sourdough round plus specialty bread like Cinnamon Raisin, Chocolate Heart, Irish Soda, Jalapeno Cheddar, Sun Dried Tomato, Corn Rye, Asiago, Sweet Cinnamon, Garlic Asiago, Olive, Rustic Stuffing & Challah. Why decide when you can have it all? 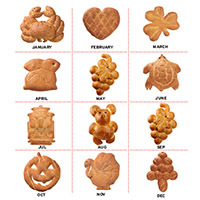 Our Banner Assortment includes all of your favorites, including two 1 lb. long loaves, two 1 lb. round loaves and six 7" sandwich rolls.